Traditional whoopie pies get the ice cream treatment in this dish, which also features chocolate shavings and cinnamon. 1. For cakes: Sift together flour, baking powder, salt and cinnamon. Cream butter and sugars together with paddle attachment until light and creamy. Add eggs and buttermilk and mix until combined. 2. Combine milk, baking soda, vinegar and extract. Add vinegar-milk combination, alternating with sifted dry ingredients, to creamed butter mixture. 3. Scoop batter onto parchment-lined pans using 1-ounce scoop. Allow to rest in cooler before baking. Bake at 350 F for 8 to 10 minutes. 4. 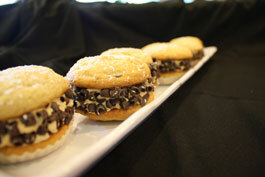 To serve, sandwich about 2 ounces ice cream between two whoopie pie cakes and roll in chocolate shavings.